FUEL PRICE INCREASE: Piecemeal or One-time? I applaud Sen. Chiz Escudero for his brave stance recently of slamming the current and apparently incompetent Secretary of Energy Angelo Reyes for the ill-conceived remarks made by Mr Reyes on an important issue of fuel price increases. As we all know, the price of oil is ever increasing and in fact has increased 18 times since the start of the year which makes for a total of P18 a liter for gasoline and P19.50 for diesel. 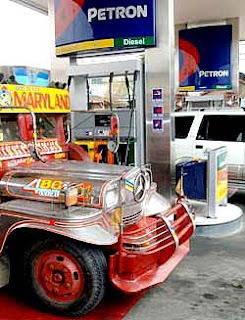 What ticked Sen. Escudero is the very public endorsement of the Secretary of Energy to give a one-time large increase of P10 per liter in oil prices instead of the current incremental increases for the price of petroleum products. First of all, the Secretary should have thought about who benefits from this proposal. Is it the public who he serves as a Cabinet member of the government? Or is it the oil companies who earns record profits from the increase in oil prices and would not even guarantee that this one-time large increase would mean no future price increases in the future? There's no doubt in my mind that the buying public would be at the losing end if this ever happens and that the oil companies would hail Angelo Reyes for protecting their interests. Secondly, Mr Reyes argues that this one-time large increase will awaken the people to the current realities of high oil prices and that they would start to consume less fuel. I couldn't disagree with him more on this. We all see that even with the current incremental increases in oil prices, the people have already tighten their belts. The evidence to this scenario is quite obvious to be missed by a supposedly capable Energy secretary. We all know that EDSA for one has experienced a sudden decrease in volume of motor vehicles by about 10% according to MMDA data. It has been reported also in every news channel that the MRT is swelling in passengers from 450K a day to a staggering 533K a day in spite of its only 350K maximum capacity. Do all these not mean that the public has already reacted to the situation? I don't know how the secretary thinks but if he is out of touch to the plight of the people or if he were sleeping in his job, then I would understand. But if he were, he must be removed from office. Thanks to Sen. Chiz for watching out for the interest of the Filipino people. Glad I voted for him!